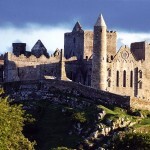 Would you like to visit the beautiful Ireland in a few weeks? 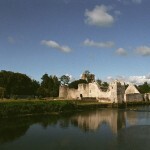 Our deal hunters found you an offer to Kerry, which is located at just 10 miles from Shannon. 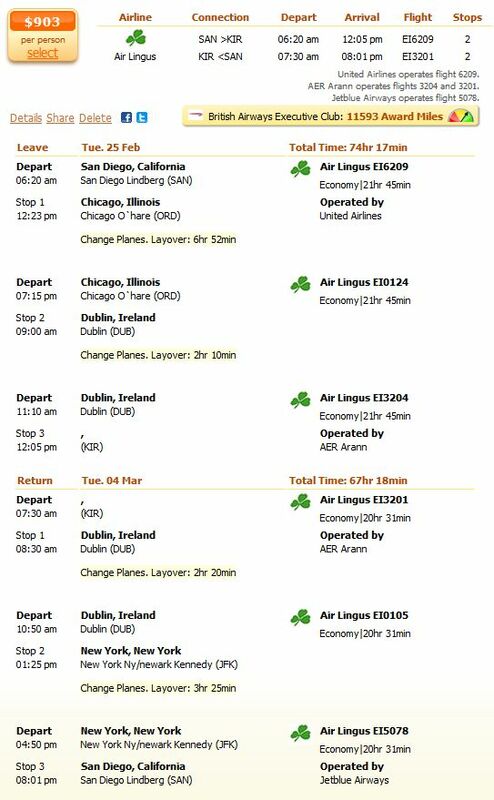 Choose this last minute Kerry flight with Air Lingus for $903 and depart from San Diego on February 25 and return on March 4. This flight has two stops. Search the box below for other Ireland airfare deals, maybe you find an even better offer for your needs. Check the offers of more providers to get the best price. If you choose the flight presented by us, you will depart from the San Diego Lindberg Airport (SAN). You have an almost 7 hours stop at the Chicago O`hare Airport (ORD), then an other stop of two hours at the Dublin Airport (DUB), before arriving to the Kerry Airport (KIR). On your way back you will change planes at Dublin and at the Kennedy Airport (JFK) in New York. Please check the screenshot below for further details. After searching for the Ireland flight deals of other airlines and the next best offer which arrives to the Shannon Airport (not to Kerry) has the United Airlines for $1024. This is 13% more than the offer of the Air Lingus, which counts at these prices. The Lufthansa has tickets for $1097 and the Air Canada for $1105. The Passengers of the Air Lingus can have one bag free of charge, weighing up to 23kg (50lb) and with the maximum dimensions (length + width + height) of 158 cm (62’’). Infant baggage allowance is 10kg (22lb) in addition to one collapsible stroller. According to the website of the airway, you have to pay an additional $100 for excess weight or for additional bags. The weight of any one piece of baggage must not exceed 32kg (70lb). At Air Lingus by adding your bag online, you will save at least 50% on the price of airport baggage charges, so enjoy greater savings by pre-booking your bags in advance.